The Note 4 has a Quad HD Super AMOLED display that will improve resolution and quality, though the screen size remains the same. The camera now enhanced to 16 megapixels and front camera now 3.7 megapixels with f1.9 which enhance the photos with more light so that your photos will be more clear in a low light situations. Smart OIS + DIS faster pictures and improved performance. Now Note 4 also comes with Selfie wide angle mode to take wide angle shots with lots of people with you in background. There’s a multi-window to take advantage of the screen’s large size and an S-pen to write. Note 4 charge much faster than previous generation it takes around 30 min. to charge from 0% to 50%. 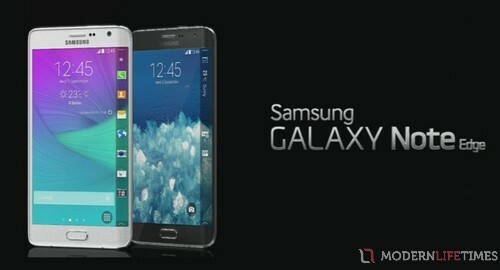 Note 4 is somwhat similar design concept like we have seen in Galaxy Alpha. Note Edge is awesome device we have ever seen and it’s anew concept in smartphone with curved edge display, a phone with a bar at the right edge that runs horizontally on the edge of the phone. That display can be changed to show email or other top-priority information like the weather, and turns into an alarm clock at night. Samsung also announced an open Edge SDK for developers to play with the new bar. Still no information on release so far. Gear S (SmartWatch) which is similar to Samsung Gear Fit but this one is more advanced from it’s previous generation. It has 2-inch curved OLED display that looks great from any angle. Waterproof, comes black or white colour and it can comes with many other colours to match your style. The Samsung Gear S extends its communication capability not only with Bluetooth but also with 3G network and Wi-Fi connectivity. Now you can stay on top of what’s happening with seamless notifications from social networks, calendars and applications, even when away from their phones. The Samsung Gear S also lets you make and receive calls directly from your wrist as well as getting calls forwarded from your smartphone. The device lets you enjoy seamless communication by freely switching between connections, automatically connecting and synchronising information once it is paired to your smartphone. Gear VR is most creative and innovative product of technology created so far, which let us dive into virtual reality world and experience it. Samsung made impossible into possible. The Gear VR device is made in partnership with Oculus VR and is Samsung’s push into virtual reality. Focus on entertainment and virtual reality make your mobile experience more amazing. “It’s a virtual cinema,” says Samsung EVP John Pleasants. The Gear VR will be on sale later this fall.